With so many Christmas-themed events happening in the Bloomington-Normal area, it’s easy to get into the holiday spirit! Christmas is the perfect season to spend time with your family, friends and loved ones. 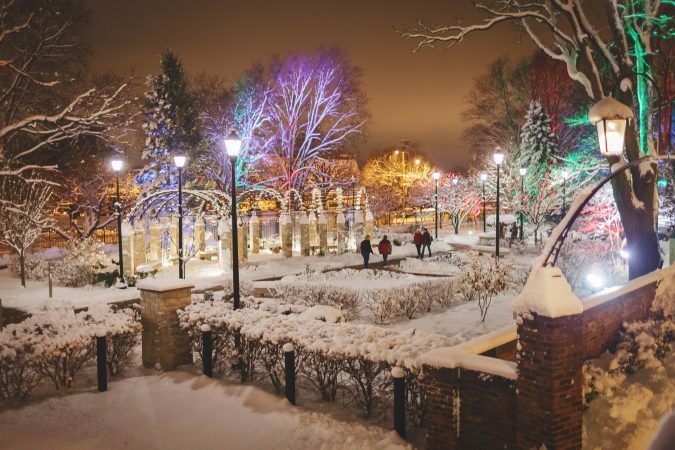 Uptown Normal, Downtown Bloomington and all of our attractions will fill you with the spirit of the season. The McLean County Museum of History will open its doors to the entire community for a day of family fun and holiday cheer at Christmas at the Courthouse. Visitors will enjoy holiday music, caroling, homemade cookies, and cider at this free, family-friendly event. Santa will be making a stop in Uptown Normal this holiday season at Santa’s Station, located between the Children’s Discovery Museum and Uptown Station. Opening day kicks off on December 1 and parents are encouraged to bring their own camera for photos. Christmas is not complete without some festive music. Noel, a brand-new holiday family musical, will be performed at the Bloomington Center for the Performing Arts. Electronic violinist Lindsey Stirling will fill Grossinger Motors Arena with Christmas favorites, including “Santa Baby” and “Mary Did You Know.” The Illinois State University Friends of the Arts will host a sing-along concert of Handel’s Messiah at the Center for Performing Arts. At Once Upon a Holiday, enjoy live window vignettes in the shops of Downtown Bloomington. This is the perfect opportunity to do some Christmas shopping! The Jaycees Annual Christmas Parade will also take place in downtown and will travel down Center Street. How does Miller Park Zoo look at night? Find out at Wild Lights at Miller Park Zoo, where hundreds of luminaries will be placed around. Visitors to Ewing Manor and the David Davis Mansion will get a glimpse into the past of an Edwardian and Victorian Christmas at Christmas at the Mansions. Ewing Manor and the David Davis Mansion will be decorated for Christmas, and guests can enjoy special foods, seasonal music and costumed guides. The tour will include a Mystery Mansion, which won’t be revealed to visitors until they arrive. If you can’t make it to Christmas at the Mansions, through the month of December, the David Davis Mansion will offer visitors a behind-the-scenes look at how Christmas was celebrated by the Davis family. Christmas at Clover Lawn will highlight A Christmas Carol by Charles Dickens and the impact it had on the Davis family. Learn about Victorian Christmas traditions and see the mansion decorated in its Christmas finery. For a complete list of events happening in our area, go to VisitBN.org.